The Club is available for public rental. ​​Click here for the rental policy & contact information. April 2019 Bay Breeze: The first edition of the year! Thanks to editor Marilyn Kinnsey Brown! 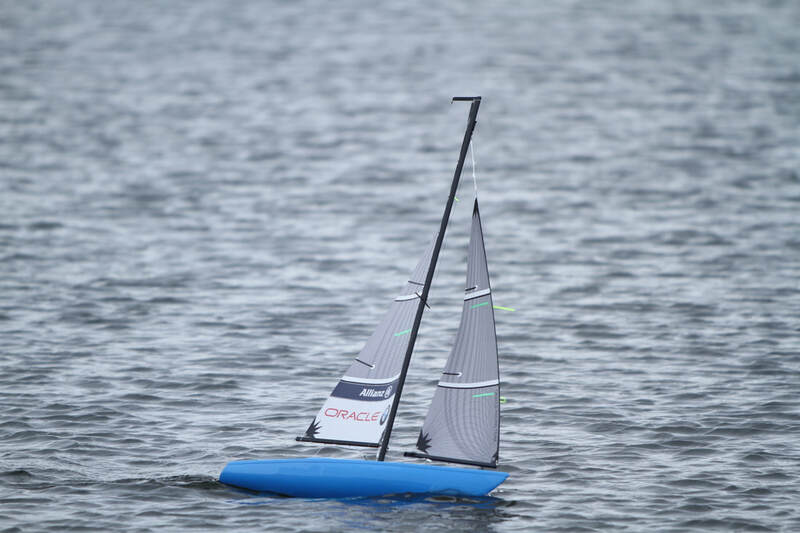 RC Boat Racing In Florida: Members Terry & Mike enjoying 'a Florida spring break' . The EYC fleet made a good showing with competitive results! 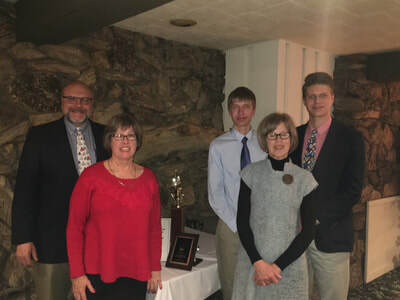 Annual Banquet: The spirits were high as the EYC members met on a cold winter night for the banquet. The Terrace Bay Resort was a festive venue and the ballroom was bright and bubbled with the conversations and laughs from the large # of members attending. The Club financials were reported with the accounts in good order. Outgoing Commodore David Anthony passed the gavel to our new Commodore Greg Gardner. The new 2019 Board is listed below and welcome to Brian Porior who was elected as Vice Commodore of Power & Cruise. The Sailor of the Year award was presented to Tom Ford with a warm introduction by Jim Hansen. The Yachtsman of the Year was awarded to Mike Sundstrom for his lifelong love of the harbor, involvement in boating, and contributions to the EYC. The award was presented to Alex Sundstrom, Mike's son. Farewell to member Mike 'Suds' Sundstrom: From his days as a teenage 'harbor rat' - Mike's life revolved around the harbor. Mike was the EYC Vice Commodore of Power/Cruise. Mike always had a smile, especially when enjoying his powerboat "Brown Eyed Girl" the nickname for his wife, Phros, who passed away two years ago. We fondly remember his smile and wave, and his Jack Russell Terriers too, as we passed by on the dock! His legacy carries on with son's Nick (Lisa) residing in Denver and Alex of Escanaba who also serves on the EYC Board. Fair winds and smooth seas Suds! Halloween & Closing Party - October 27th: Costumes are encouraged, but not required. Bring a friend! 7:00 p.m. at the Clubhouse and enjoy a scary good time! Pasta Extravaganza & Frostbite Race: Capping off the summer season was Roxanne's fabulous dinner. Her cheese ravioli with bolognese, fettucini alfredo, spaghetti with italian meat sauce, and all the compliments. The guests stated that Roxanne's Italian dinner was Delizioso (delicious) and the evening Squisito (fabulous)! The Frostbite results are on the "Race" page. ​Regatta Race & Dinner: The Regatta Dinner kicked off with cocktails at 5:30 pm. Cindy is serving a summer menu featuring Cuban pork, rice and beans, coleslaw, & dessert. 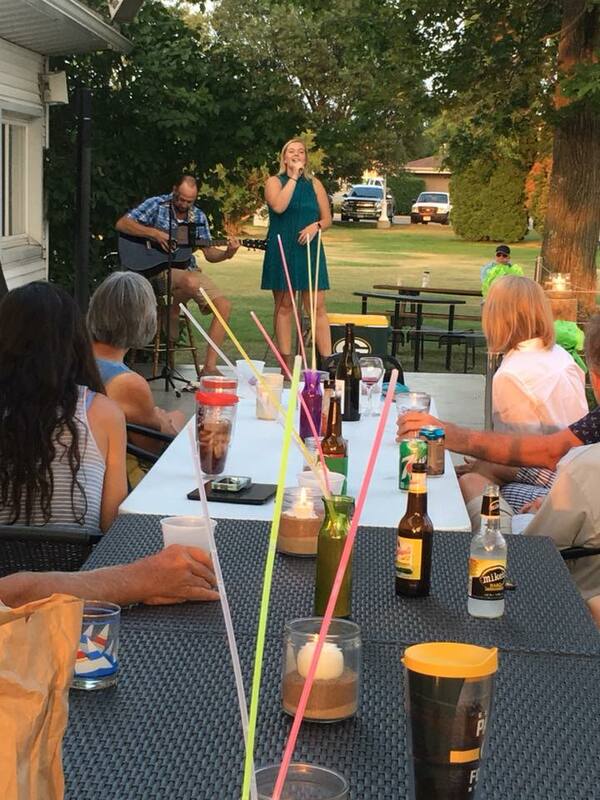 Live music by Chloe Smith topped off the beautiful summer evening! Skippers meeting at noon with results on the race page. 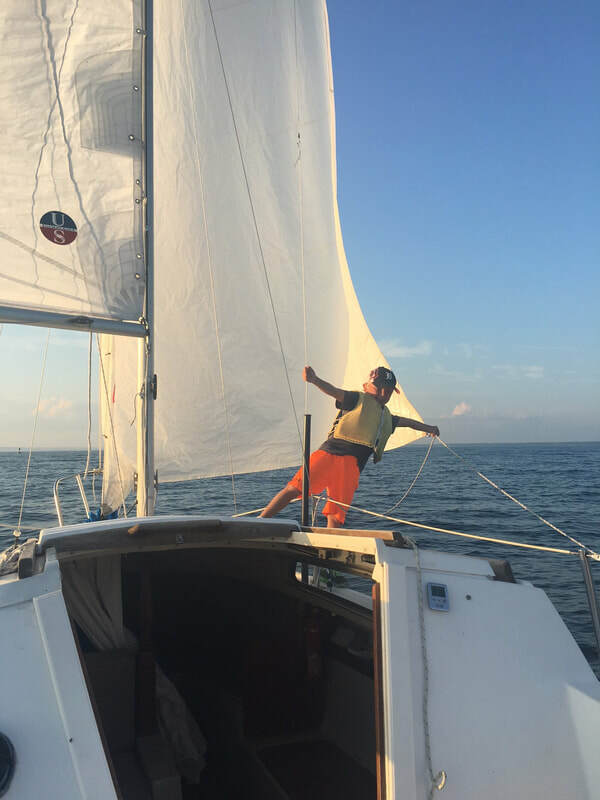 ​Come Sail Away: Year two was another smashing success! Approximately 30 people enjoyed a sailboat ride and all the time slots were filled. We had such a great day at the EYC meeting new friends and giving sailboat rides. Thank you to the skippers: Jim and Alice Hansen of Galivant, Dave Anthony of Moonshadow, Jenny and PJ Bissell of Tritium, and Tom Woodaz of 7-Up. Special thanks to all the crew who assisted and Sue Clifton who helps her sister Cindy with everything! ​Ann Shipman Memorial, Saturday, July 7th: The family of Ann Rita Shipment (June 2, 1931 to October 9, 2017) invite you to celebrate her life. A memorial funeral service will be held on Saturday, July 7th, at 11 a.m. at St. Joesph's Church in Escanaba. Luncheon will follow at 12:30 p.m. at the Escanaba Yacht Club for family friends and EYC members. Ann will be missed by all. July 4th Brunch: Come down to the EYC and share some pancakes with us! Only $8 per person and kids under 5 are free. Open to the public! We look forward to seeing you on the Fourth! Marina Fest, Saturday, July 18th: Music, sun, & fun from 10 a.m. until 11 p.m. With 5 bands, 3 food vendors, games & activies! Mid-Summer Race, Wednesday, July 11th: Island or Jimmy Buffet attire required on the boats. Post race social is bring a snack to share. EYC Commodore's Dinner & Stoll Race - June 16th: Another great Commodore's Dinner! Thanks Cindy, David, and helpers!! The classic C.W. Stoll Race was a no go this year. Following a 1 hour weather delay the thunderstorm activity required a cancellation of the race. Next year! EYC Opening Party & Fun Run - June 1st: The EYC Members and guests enjoyed the Opening Party and Fun Run Parade. Great turnout, great evening! Breaking News: A HISTORY OF THE ESCANABA YACHT CLUB 1934-1959 by John Mitchell - Edited by Marilyn Brown (2018) is now available. A fascinating history of the EYC and boating on the Bay. Check out the photos! Click the Club "History" page. Halloween Closing Party - Saturday, October 28th: The EYC members donned costumes and had a scary good time. Thanks Cindy for hosting the ghosts and goblins! September 9th Pasta Dinner & Frostbite Race: Roxanne served members and guests with a fabulous pasta dinner featuring her homemade sauces and a beautifully decorated club. Pasta-licious! Thanks to Roxanne, Dan, Dane, and all the helpers! 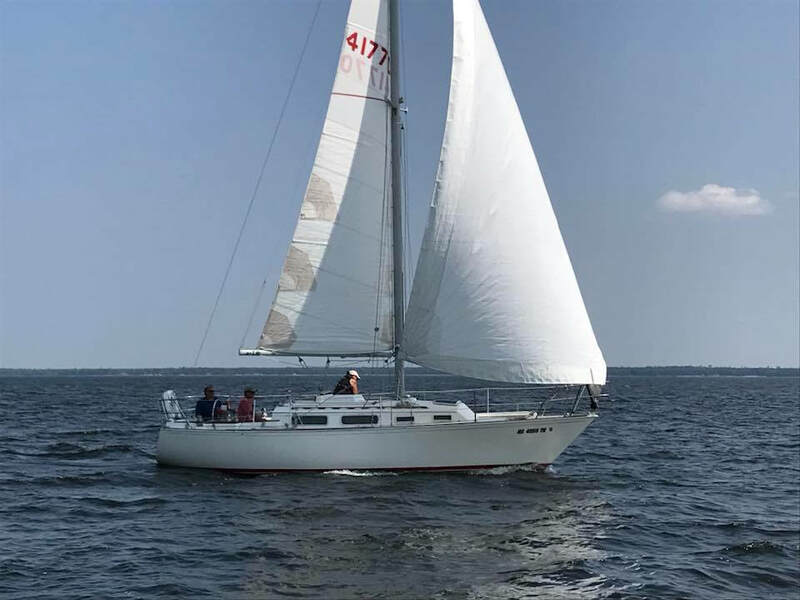 Congratulations to Josh Anthony & Moonshadow for taking the top spot in the Frostbite Cruising Class and to Dolce, skippered by Bob Yin, on 1st in the Spinnaker+ class! The results are on the "Racing" page. 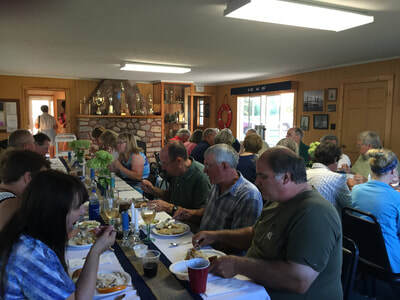 August 19th Docktails Party & Dinner: Thanks to Social Chair Cindy and helpers for serving a wonderful dinner featuring Honey Lime Ginger Pork. Also, thanks to the EYC members who extended the dock hospitality through tours, snacks, and refreshments! August Race Series: Racing resumes for all classes beginning August 2nd. Marina + Festival - enjoy the Marina Fest this Saturday! A fun sailing race, radio controlled sailboat demo, food vendors and of course the talented music! Bring a lawn chair and relax. Sailing race - Skippers meeting at 11 a.m. & start at Noon. 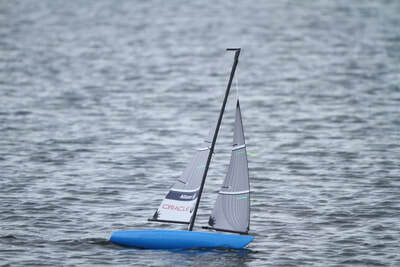 Radio Control Sailboat demonstrations and race at 4:30 pm by the Gas Dock. July 15th 'Come Sail Away': A big success! A new club event to introduce boating and the EYC to the community was held on July 15th. The EYC invited the public to enjoy our beautiful Little Bay de Noc and enjoy a free sailboat ride. All 30 opens were filled in advance. Times for 1 hour rides were 10:00, 11:30, or 1:00 p.m. Thanks the following 5 boat owner who gave there time the event by providing rides to the participants - Anthony, Gardner, Hansen, Woodaz, and Good. Thanks to Greg Gardner and Cindy Anthony for organizing the event. 4th of July Breakfast at the Club: TA beautiful summer morning welcomed the July 4th breakfast. A hearty breakfast helped the members, visiting boaters, and the public start get the stay started right. Thanks to Jim & Alice Hansen, Roger and Windy Good, and the members who helpd. Kick of the Summer Season at the EYC! 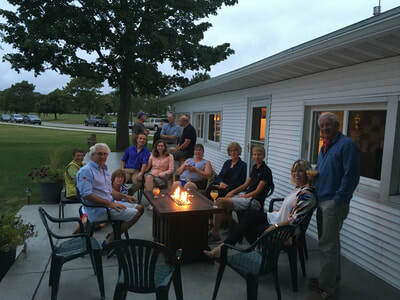 Come to the opening party and reconnect with your boating friends beginning at 6 p.m. Bring a snack to share. No charge and we will have pop and ice. Please tell the parade officials that you are going to the EYC and they will let you past the barricade. The Cruisin Classics car parade starts at 7:00. Opening Party - Kick of the Summer Season at the EYC! The Club Open Party kicked off the season with a bang. Big crowds enjoyed a beautiful June night. The Fun Run had record #'s with a reported 400 cars! Amazing!! The Escanaba Public Library is pleased to announce the generous gift of over 1,289 nautical charts from Dr. Richard Fink. This large chart collection includes charts covering parts of the Great Lakes, US East Coast, and West Coast, Canadian Great Lakes, St. Lawrence River and Gulf, Labrador, Newfoundland, Nova Scotia, Bahamas, Turks and Caicos, Caribbean & West Indies, Atlantic islands, the Mediterranean Sea, English Channel, North Sea, Australia, Indonesia, New Zealand, and Oceania. Printed charts can simplify planning and identification of details and hazards along a course, offering a very different perspective than zooming in and out of an electronic chart on a small screen. The collection will be a great resource and attraction for boaters to study charts of interest. It will also be a useful reference tool for readers who wish to view the navigable waters, mentioned in a story or article. 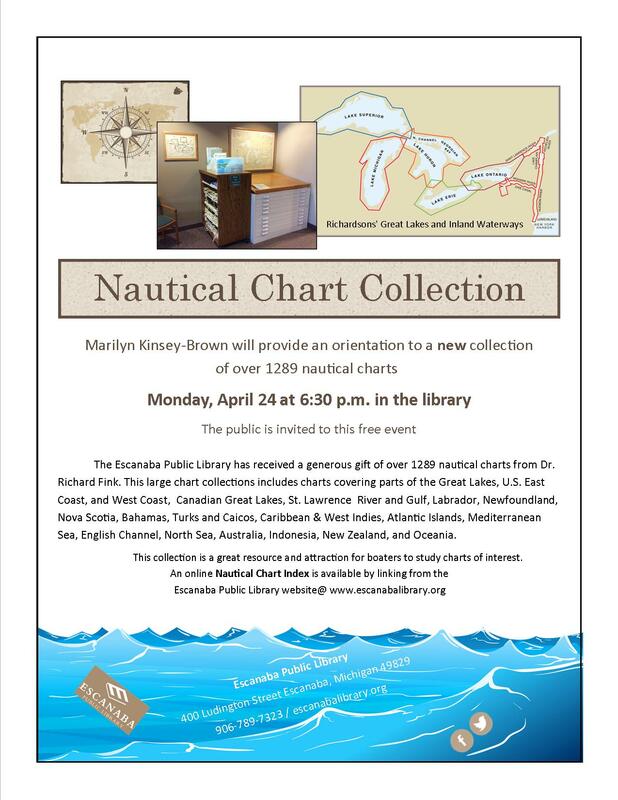 The Escanaba Public Library Nautical Chart Collection was started with the move to the new building in 1995 with chart donations from Dale and Ruthie Vinette, Terry Reynolds, Charles Vader, Tom and Peg Lippart, and Dean Shipman. An index to the new collection is located on the Escanaba Public Library website at: www.escanabalibrary.org. An orientation and presentation for the public is scheduled for April 24, 2017 at 6:30PM, at the Escanaba Public Library, 400 Ludington Street in Downtown Escanaba. For more information, call the library at 906-789-7323. Click here for the Escanaba Public Library flyer. 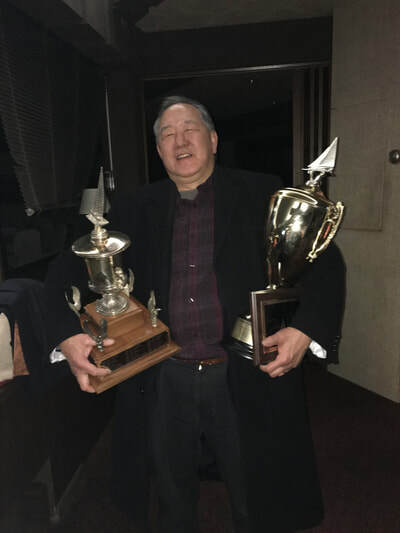 International Nite Iceboat Association sends thanks! > For members who requested a mailed newsletter, and for members without a viable email in our database, the issue will be sent soon. The Escanaba Marina and EYC is featured in the current issue of the Great Lakes Scuttlebutt magazine sharing the beauty and attractions of our area! Thanks to Todd Hurley for initiating the connection and Hurley Marine as advertising sponsor. 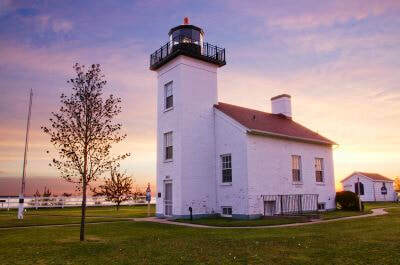 Thanks to Marilyn Kinsey-Brown for authoring the article with assistance by Escanaba Marina and Delta County Visitor & Convention Bureau. Click here for the webpage article. The Nite Iceboat Northwest Regatta was held on Little Bay-de-Noc on March 11th & 12th. 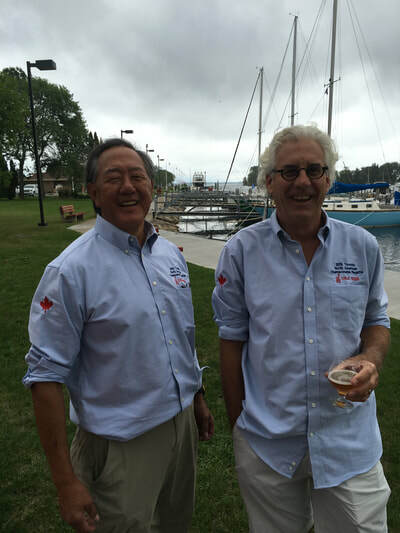 40 iceboats from the Midwest traveled to Escanaba and received a warm EYC welcome. The Regatta was based at the Terrace Bay Inn with the races sailed on the east side of the Bay. The EYC members provided coffee and the Club sponsored a hot lunch on the ice. Members also set up ramps and helped the racers rig the boats. The Nite website reported, "This place will be hard to beat". Hurrah for Terry Reynolds who coordinated with the Nite Organization, area iceboaters, and the local resources to bring this event here. Thanks to Jim Walch, Cindy-Dave-Tyler- Josh Anthony, Mike Manning, Bob Yin and many other EYC members who devoted their weekend and providing EYC hospitality. Memeber Greg Gardner served on the Nite Race Committee. Mike Derusha from Menominee, who has many local connections, was instrumental in coordinating the event and serving on the Race Committee. Members iceboaters Terry Reynolds, Bill Movalson, and Kris Photenhauer competed in the Silver Fleet. Below are just a few photos from Saturday. Also posted is a drone video of iceboating on the Bay filmed the weekend before the Regatta. 40 iceboats from the Midwest traveled to Escanaba and received a warm EYC welcome. The Regatta was based at the Terrace Bay Inn with the races sailed on the east side of the Bay. The EYC members provided coffee and the Club sponsored a hot lunch on the ice. Members also set up ramps and helped the racers rig the boats. The Nite website reported, "This place will be hard to beat". Hurrah for Terry Reynolds who coordinated with the Nite Organization, area iceboaters, and the local resources to bring this event here. Thanks to Jim Walch, Cindy-Dave-Tyler- Josh Anthony, Mike Manning, Bob Yin and many other EYC members who devoted their weekend and providing EYC hospitality. Memeber Greg Gardner served on the Nite Race Committee. Mike Derusha from Menominee, who has many local connections, was instrumental in coordinating the event and serving on the Race Committee. Iceboats 2 from Drone UP North on Vimeo. Bob Sendenburgh was a great teacher about sailing from his many years of experience. He carefully observed the weather, and knew how to select, equip and maintain a sailboat to be a pleasure to own, well into his 80’s. A small, well-built sailboat, such as a Fisher 25 Daysailor, was within his budget of time, money and physical strength. A sturdy rub rail, good protection from the sun and weather, a reliable autopilot and inside steering, an emergency anchor on the transom within easy reach, high bulwarks with sturdy handholds and lifelines to stay comfortably and safely on board, and a stereo to listen to Strauss waltzes, made sailing with Bob a pleasure! The sail plan shows a variety of relatively small sails, all on furlers, which were easily adjusted to the wind and sea conditions. With extra sailors on board, a small spinnaker was fun to show off! A generously sized motor, allowed him to sail, almost every day with moderate winds, by motoring to windward 3-5 miles, and then reaching and jibing, to turn into the wind in the lee of Sand Point to furl the sails, and motor back to his slip. He had carefully planned docklines, using a spring line with a loop to drop it over a particular post, and then power gently sideways into the dock. Ah, for a sturdy rubrail! Bob welcomed sailors on board, while at the dock, to share stories, and questions about how to fix something, or sailing techniques. The boatyard was his favorite daily location in the Spring and Fall, to chat with other boat owners, and do the necessary To Do list projects to keep his boat in reliable working order. Bob was a classy gentleman sailor, very knowledgeable, with a soft spoken voice, clear directions when assistance was needed or offered, and a wealth of sailing experience to share willingly with others. He will be missed by all who knew him. Annual Banquet Recap - January 21, 2017. • The Terrace Bay Inn provided the perfect setting for a wonderful evening. The members and guests enjoyed a great dinner and caught up with fellow members. • The program included introduction of David Anthony as the new EYC Commodore and election of Greg Gardner and Bob Rosenfeldt to the board. Don Pfotenhauer is stepping of the Board after many years - thanks Don. • Congratulations to David Anthony who was honored as Yachtsman of the Year. Robert Yin earned honors as Sailor of the Year. 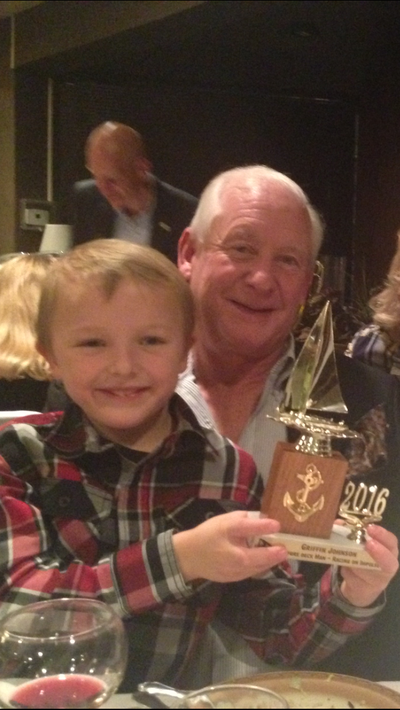 • Griffin Johnson was presented with a special trophy for Best (and youngest) Foredeck Crew. A spooky fun good time at the 2016 Holloween & Closing Party! Thanks to Cindy for hosting the EYC Dinner. Walk the Dock featured Dolce, Northern Venture, Impulse, and Moonshadow. The Regatta Race was cancelled do to weather. 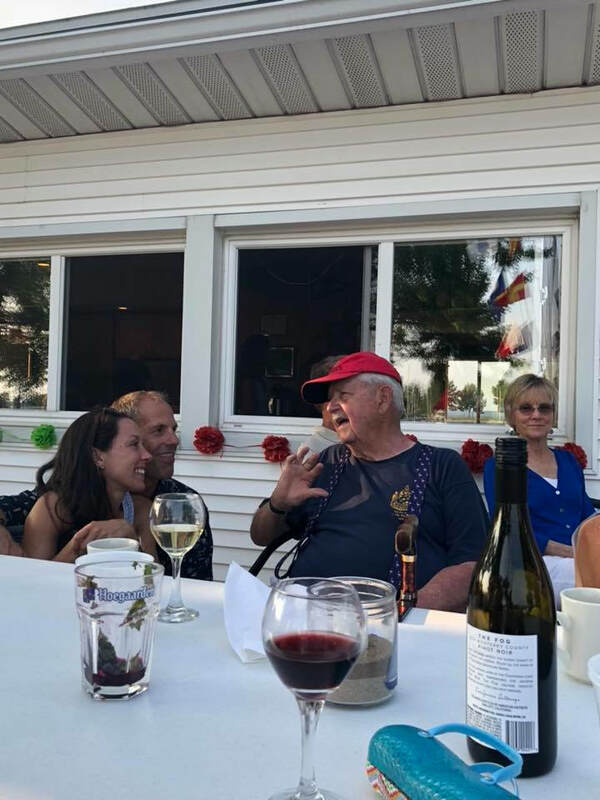 The Escanaba Yacht Club is for all ages and interests! EYC Burgees are available for $25. Contact a EYC member to get yours!